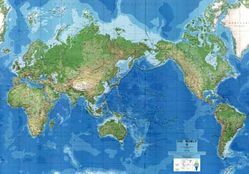 This physical world map can be a world mural map at approximately 74" x 55". It comes in 3 sheets and requires some trimming so that you can orient any way you want (pacific centered, atlantic centered or even americas centered). The smaller size comes in one sheet, measures 56" x 42" and is a pacific centered world map. The combining of elevation tints, topographic lines, and mountain shading make this a beautiful physical world map AND it also includes country boundaries with a black line. 2 sizes: 74" x 55" and 56" x 42"